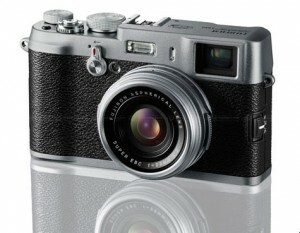 Is the X100 the shape of things to come? I think that the professional digital photography industry is starting to settle down. In the beginning just being able to capture an image was amazing stuff. Back in 1991, the first Kodak cameras the DCS 100, were mangled Nikon F3 bodies attached to a humongous contraption were all of its computer components lived. 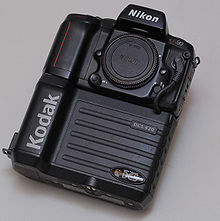 The 1994 Kodak DCS 420 was a lot of camera for 1.2 megapixels! Quite a monster, considering it was 1.2 megapixels! Since that time the DSLR has evolved into a tool of more manageable size, speed, and power. The typical pro DSLR body is a grand configuration of buttons and wheels, digital readouts of text, numbers, graphs, and images. While it looks kinda like a camera, I’m still reminded of seeing Dean Collins give a presentation at Photo Expo East in the mid 90’s. He had a “high-end” Foveon digital camera which looked like a laptop with a lens on it. Hey, in essence, that’s what a digital camera is , a computer attached to a lens. This year Fujifilm has announced a camera that has shaken things up a bit. They have introduced a camera with mechanical parts. A camera with a shutter speed dial on the body, and an f/stop ring on the lens. It looks like a rangefinder, but it’s not. It looks expensive, but it’s not, relative speaking that is. It is the FinePix X100. It actually reminds me of my very first camera, the Petri Racer, but looks more like a Leica M3. Leica also as a mechanical looking camera that’s less than $2000, the Leica X1. The X1 doesn’t have its f/stops on the lens, but on a dial on the body. The X1 is a good looking camera, very sleek. It maintains its heritage and looks much like the camera Oskar Barnack created back in 1914 and introduced to the public in 1925 Still the X100 has got its “retro” down. I received an email today from Fujifilm releasing the first “official” sample images created by the X100. As usual these aren’t great pieces of photographic art, but they do show off the technical aspects of this 12 megapixel camera. I won’t bore you with the technical specs, you can check out the preview of the camera at Digital Photo Review. The thing that excites me about this camera is that, well, it’s a camera. I love cameras and their gadgets. The X100 takes me back to that time were the magic of photography had embraced me. I time were all I needed to know was shown to me at a glance without having to turn the camera on. Yet the X100 will give you that warm fuzzy feeling plus all of the techno stuff one feels they must have with a modern camera. This was a bold, brave move on the part of Fujifilm. They know there are photographers out there who know what they’re doing. And by that I mean photographers who love making images, or maybe I should say , love taking shots! Great shots with a minimal equipment complement. This camera doesn’t seem as “pocketable” like my Panasonic LX3, but it has a bigger APS-C CMOS sensor. I don’t any other compact camera has a sensor as big except for the Leica X, that is not a 4/3 camera, which is smaller than the APS sensor. So it’s closer to my Nikon D200 DSLR with out the bulk. A good “take everywhere” camera. I hope that this will be a new trend for camera manufactures, making small “serious” cameras.